This article uncovers changes that occurred in preservice teachers' thinking about and use of technology infusion and its role in student learning. It reports on findings from a two-year evaluation study of a preservice teacher technology in-fusion project in which teams of teacher educators and K-12 teachers collaborated to infuse technology in their respective teaching contexts, and to create links between these contexts. Each team created (a) hands-on experiences with computer technology to support constructivist teaching, (b) two-way interactive videoconferencing between college courses and K-12 classrooms, and (c) field experiences in technology rich classrooms. Based on analysis of survey and focus group data, classroom observations, and analysis of preservice teachers' work, findings indicated that preservice teachers changed their views of technology infusion from thinking that they would teach and learn about technology to thinking they would use technology to support student learning. Project design features, as well as implications for future practice, are discussed. VANNATTA, R., BEYERBACH, B. & WALSH, C. (2001). From Teaching Technology to Using Technology to Enhance Student Learning: Preservice Teachers’ Changing Perceptions of Technology Infusion. Journal of Technology and Teacher Education, 9 (1), 105-127. Norfolk, VA: Society for Information Technology & Teacher Education. Retrieved April 24, 2019 from https://www.learntechlib.org/primary/p/8456/. Jackson, D. (1998). Developing student generated computer portfolios. Technology and Teacher Education Annual, 1998 , Charlottesville, VA: Association for the Advancement of Computing in Education. National Council for Accreditation of Teacher Education (1997). Technology and the new professional teacher. Washington, DC: National Council for Accreditation of Teacher Education. Thoman, E. (1998). Skills and strategies for media education. Educational Leadership ,56(5) , 50-54. Wetzel, K. (1993). Teacher educators’ uses of computers in teaching. 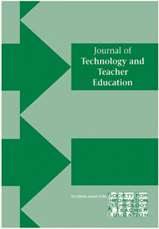 Journal of Technology and Teacher Education, 1(4) , 22-27. Windschitl, M. (1998). The WWW and classroom research: What path should we take. Educational Researcher, 27 (1) , 28-32.